update on the references experiment. in this period (15.10.2009-21.10.2009) references were visible. I got 17 requests. all predictions are confirmed, and there's a clear distinction between the curves. more and more, I seem to have found a very simple way of controlling the distribution of quality of requests. not only that, but the percentages of low scores continue to be remarkable. so, copy pasters are about 25% of requests and low scores combined are about 74.1%. almost 3 out of 4 people, even with references showing, make poor requests and copy paste. it's all about the free place to stay! ha! sample sizes are 31 with references and 25 with hidden references. combined data yields 37.50% for copy pasters and a total of 73.22% low scorers. 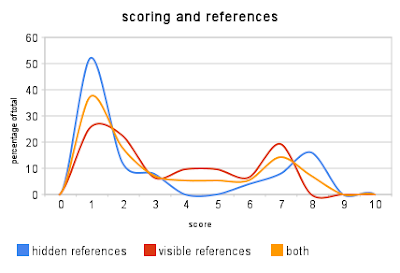 there is no significant difference between the low scoring percentages of both references and no references: scores <= 5 are 72% and 74.1% from no references and references respectively. the only thing that changes is the distribution, as seen in the picture. in practice, this method allows to detect a clearer decision threshold, as the blue graph shows two very distinct peaks, whereas the red one has more average hard-to-decide-on requests. this means that, in all numerical glory, the best way to decide whether someone will be a good guest or not, is to hide all references in a puzzle, and remarkable people will stand out. test will continue, as even though it might seem I'm on to something, I still need to tune this system. my guess for a good metric is the "you" vs. "me" metric, but that will require some development.